Hearing what our patients have to say about us gives us a great sense of satisfaction because we know that the dental office is not your favorite place to be. Knowing we can make it a positive experience for you matters. Take a moment to read through some of our reviews and hear what other patients are saying about us. Thank you for being the best dentist I have ever been to, in my 16 years. When I came home and looked at my teeth, I was thrilled. Having moved around a lot as a kid growing up and as an adult I've seen a number of different dentists over the years. I can say without questions that Dr. Canepa's office is my all time favorite. In this office you will find four of the best ladies in this or any profession. I'm 41 years old and I've been a patient for over 10 years. In that time I've had several different procedures from fillings to replacing a chipped tooth to a crown. I've always felt relaxed and comfortable whether getting a routine cleaning or something more. They care about their patients and treat them like friends. So much so that going to the dentist is now something I look forward to! You will too. I can't recommend them highly enough. Everyone is so friendly and helpful at Dr. Canepa's office. The staff is very professional and they really took the time to make me feel comfortable during my recent crown procedure. One of the things I like the best about the office is that they value my time and will give me a call if they are running behind schedule that day. I definitely will be coming back regularly. "I would describe my visits to Dr. Canepa's office as health affirming, informative and restorative experiences. Regardless of the nature of my visit, I am treated with thoughtful care from my entrance into the greeting room to my departure. Dr. Canepa and her professional team work with remarkable synchronicity to support the healing and well-being of their patients. Their exemplary approach to dentistry transforms an ordinary dental visit into one that instills an appreciation in patients of their innate capacity for a favorable outcome to treatment. I trust and value that Dr. Canepa has my best interests at heart and sets that standard of integrity for her assistants--a hallmark of excellence. The success of what I view as a true partnership of professionals is not only measured by the effectiveness of Dr. Canepa's treatments, but beyond measure in the peace of mind I have gained from knowing I am in the most capable hands as a patient of Dr. Canepa's dental practice." 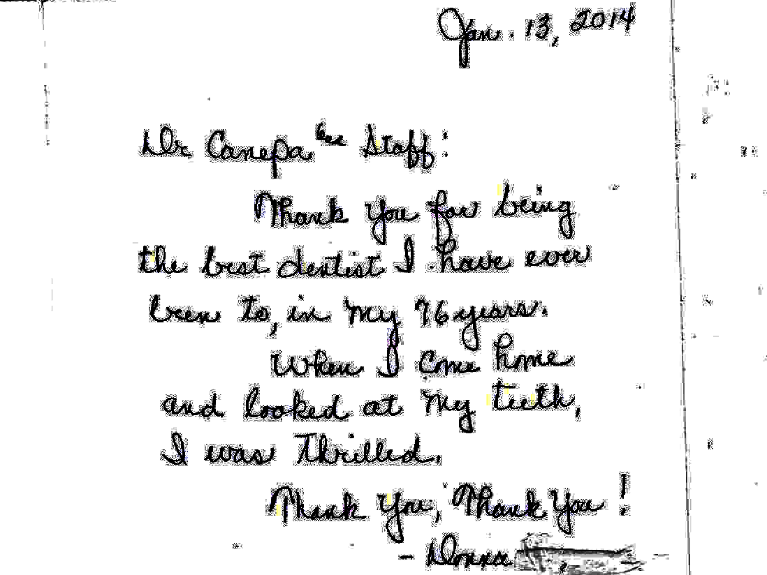 Over the last 25 years, Dr. Canepa and staff have taken great care of my family's dental needs. From routine checkups to needed procedures, Dr. Canepa demonstrates her expertise with exceptional competence and compassion. I chose Dr. Canepa because of her qualifications (graduating from Case), and because of her warm caring and pleasant personality. My young children loved her. They felt comfortable going to the dentist and always left with a smile. Yes, I have the pictures to prove it! As adults, my granddaughter is a patient as well. Throughout the years, Dr. Canepa and her staff carefully monitored and explained all my questions and concerns regarding dental health. Her use of new equipment and technology demonstrates her desire to give the best treatment to her patients. I would highly recommend Dr. Linda Rak Canepa.